Java Swing is the extension of Abstract Windows Toolkit (AWT). Any component designed in Swing will appear same on any platform. As we know that AWT is internally dependent on C language code and C language is a Platform dependent so in java, it is not desirable. Any component developed in AWT, its look and feel changes depending of platform. 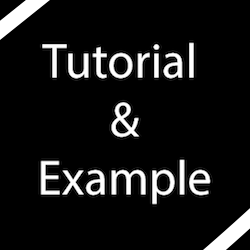 For example, if you write code for a push button in AWT, when you run that code in Windows it will display windows type of push button whereas same code executed in UNIX operating system then it will display UNIX type of push button. So we can’t be sure how a particular screen will look on a particular operating system because its appearance changes from system to system. To fix the problems of AWT, JavaSoft people redeveloped complete AWT package without internally taking the help of native methods. So all AWT classes extended to form new classes and new class library is created, further this library is called as Java Foundation Classes (JFC). 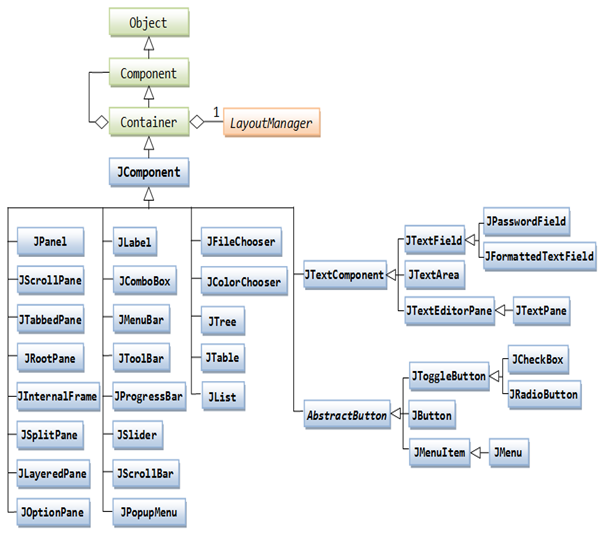 Java Foundation Classes created five main library package which is very popular in GUI designing. JFC library classes create light-weight component so it consumes less resources (memory, processors) and execute much faster than AWT component. Any Component created by using JFC library classes appears same on every platform. JFC is an extension of AWT, so all the methods that we used in AWT are also applicable in JFC. Among five main JFC library, Javax.swing Library is very famous and it’s used by every programmer. Model: it’s represents the data of any swing component. View: It’s represents visual appearance of the any swing component based on the data model. 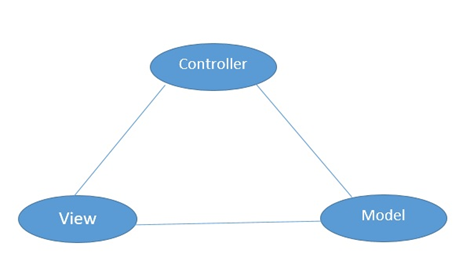 Controller: It is the mediator between the model and view. Whenever user interact with the swing component, first of all controller will understand this and modify the model data accordingly. In Javax.swing package there are lots of important classes. These all swing classes are derived from java.awt package. How to Create a Frame in swing? 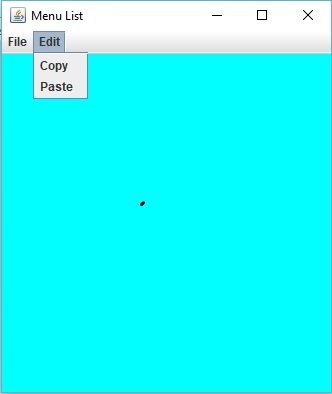 A frame represent a window with free area which has a Title bar and border. In that free area we can display any Text or any component can be displayed. 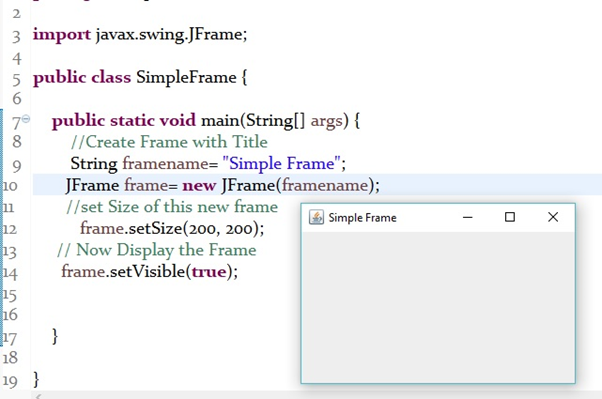 To create a frame we have a JFrame class in swing package. 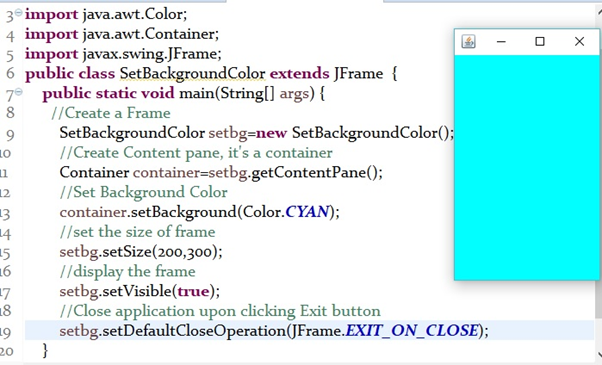 To Close a Swing frame, we need to take help of methods of JFrame Class. getDefaultCloseOperation(parameter) => it’s method of JFrame Class. 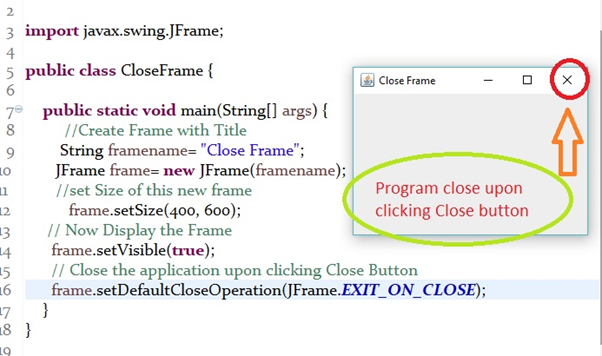 JFrame.EXIT_ON_CLOSE => it closes the frame/application upon clicking on Close button. To set the background colour in frame, we have to set the background colour in the Content pane. Content pane is the free area of any frame. How To Display Text in Swing Frame/Application ? Text can be displayed by using label. We can use JLabel class to create label. Check Box: with the help of JCheckBox class, we can create Check Boxes. 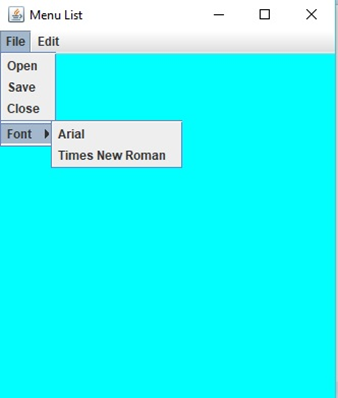 Text Field: Text field can be created with the help of JTextField Class. Text field can accommodate only one line of text. 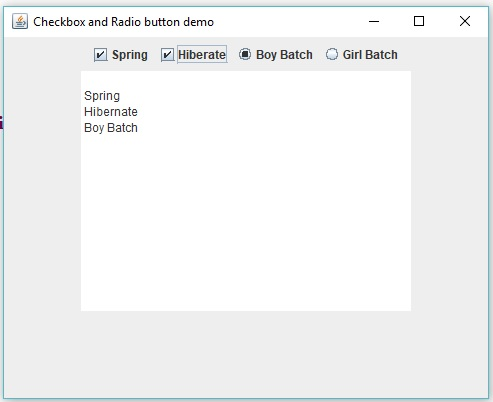 Radio Button: Radio Button can be created with the help of JRadioButton Class. Text Area: Text Area can display multiple line of text. With the help of JTextArea class, we can create a text area. Text Area without any text in it. Text Area with Some Text in it. Menu is collection of similar types of group of items. With the help of JMenu class, we can create a menu in Swing frame/application. With JMenuItem Class, we can create group of menu items. Program: Creating a Sample Menu List. //it will execute when menu item is clicked. How to Create Progress Bar in Swing ? Progress Bar is visual representation of any task completion. It represent that how much any particular or a group of task has been completed. 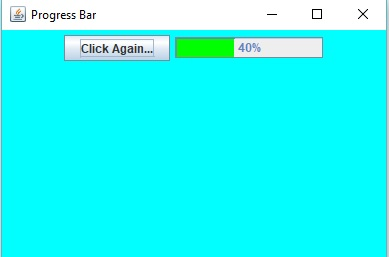 With the help of JProgressBar class, we can create Progress Bar. Note: Swing is a big topic, so in 1000 words we can’t explain every feature. It’s a 1900 word Article.